Billboards are now on display across British Columbia as the Government of Alberta launches a nationwide campaign to highlight the economic, social and environmental benefits of the Trans Mountain Pipeline expansion. 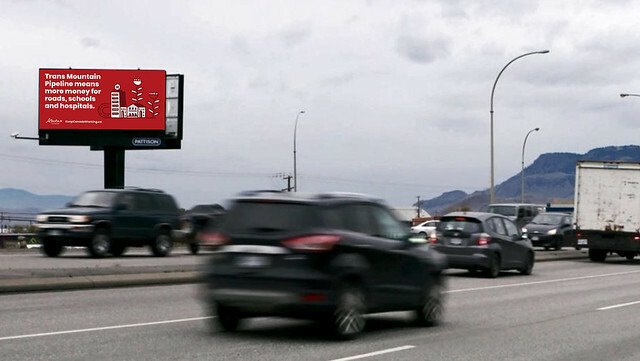 An example of a billboard supporting Trans Mountain Pipeline in Kelowna, B.C. The “Keep Canada Working” campaign will inform Canadians about the benefits of market access and counter the misinformation, harassment and obstruction that the project has faced. The campaign’s goal is to speed up market access for Alberta’s energy products by increasing awareness of the benefits of an expanded pipeline and - as a result - increasing support for its speedy construction. The lack of access to international markets is costing the Canadian economy up to $15 billion annually, or approximately $40 million per day. The cost to Alberta government revenue alone represents about $2.3 billion per year, or $6.5 million every day. The “Keep Canada Working” message will be shared via billboards, television, radio, search engine marketing, online display and social media. Billboards and digital advertisements have been running since April 30. Television and radio advertisements are in production. The ads will direct people to KeepCanadaWorking.ca, where they can find more information on how the pipeline expansion will directly benefit Canadians and how they can get involved. Trans Mountain Pipeline means more money for roads, schools and hospitals. Trans Mountain Pipeline moves Canada’s economy forward – creating economic activity from coast to coast. Trans Mountain Pipeline puts Canada first – making us less reliant on American markets. Trans Mountain Pipeline is critical to Canada’s climate plan – revenue generated will fund greener energy sources and innovation. To date, Alberta has spent $1.29 million on this nationwide advertising campaign. About $700,000 has been dedicated to advertising in British Columbia, including digital board locations in Vancouver, Victoria, Kelowna, Kamloops and the west Kootenays, Abbotsford international and Nanaimo regional airports. Scotiabank estimates that the discount on Canadian oil caused by pipeline bottlenecks costs producers and the Canadian economy as much as $40 million per day. A Conference Board of Canada report has determined that the combined government revenue impact for construction and the first 20 years of expanded operations is $46.7 billion, including federal and provincial taxes that can be used for public services such as health care and education. Municipal tax payments (not adjusted for inflation) total $922 million to B.C .and $124 million to Alberta over the first 20 years of expanded pipeline operations.